For more pictures of the community and school click here. 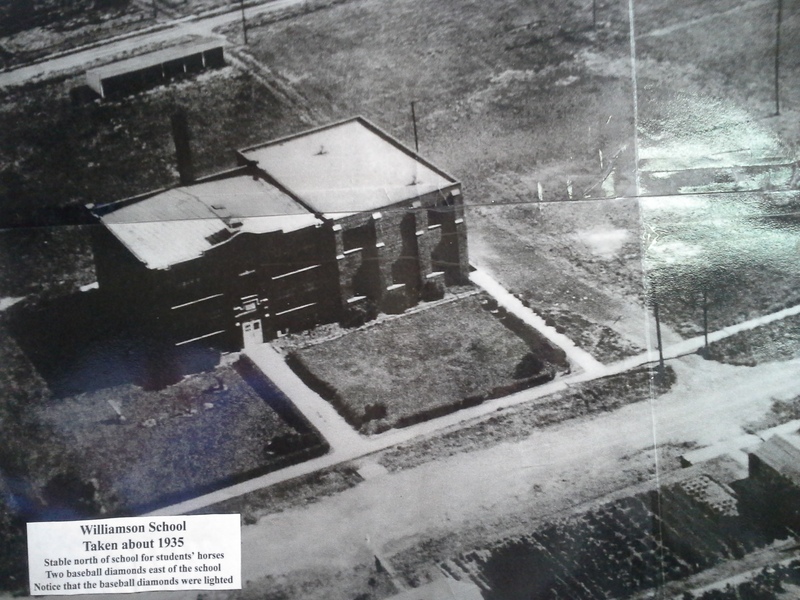 The Williamson School building was constructed in the spring and summer of 1923 by contractor Austin Enslow and son, Monte, at an approximate cost of $16,000. The building is located in the northwest quarter of the town of Williamson and commands a pretty view of a broad stretch of level cultivated fields and at that time overlooked several farm homes. It was a fine brick structure 50 x 50 feet with two stories and a basement. The walls were built of hard brick and tile with steel frame and reinforcements and steel window sashes. It was equipped with fire escapes, electric wiring, and fixtures complete throughout the building. The drainage system and disposal basin were included to make the building completely modern. The steam heating plant was furnished by G. W. Ensley and was fired with coal from the mines nearby. The basement was fitted with cement floors. The west half, a space of 50 x 25 feet, was used for domestic department and manual training while the other half was divided for toilets, coal storage, and a furnace room. The first floor was divided into four classrooms which housed all the grades up to eight. A broad corridor ran north and south the entire length of the building allowing easy access to all four rooms. The upper story was used for the high school which at that time included the first three years of training with plans to add the fourth year later as attendance grew. In September, 1925 the fourth year was added and this class became the school’s first graduates in the spring of 1926. On the north side of the building there was a large assembly room measuring 25 x 50 feet. South of the assembly room were two small rooms intended for recitation or study rooms. The building was so planned that an addition could be made without interfering with the structure of the rest of the building. In July 1929 bids were collected to add a gymnasium and other rooms needed due to the increased attendance. This addition was also built of brick and concrete and allowed the curriculum to be extended, improved, and modernized. At this time the library was updated, walls were painted, and the appearance of the building was improved. Standing before the building today, one sees the Williamson School much as it was then. The building consists of a two-story rectangular brick edifice, constructed in 1923, and a 2-story brick addition erected on the east side of the building in 1929. The original building featured a symmetrically placed, round arched, entry. Single windows are set in rectangular surrounds. The 1929 addition features paired windows and what appears to be symmetrically spaced wall buttresses. The building is capped with a flat roof. As Williamson began to develop a basketball team and became a member of the Chariton Valley Conference the gymnasium was remodeled. The floor space was enlarged and balconies were built on both sides making a seating capacity of two hundred fifty. 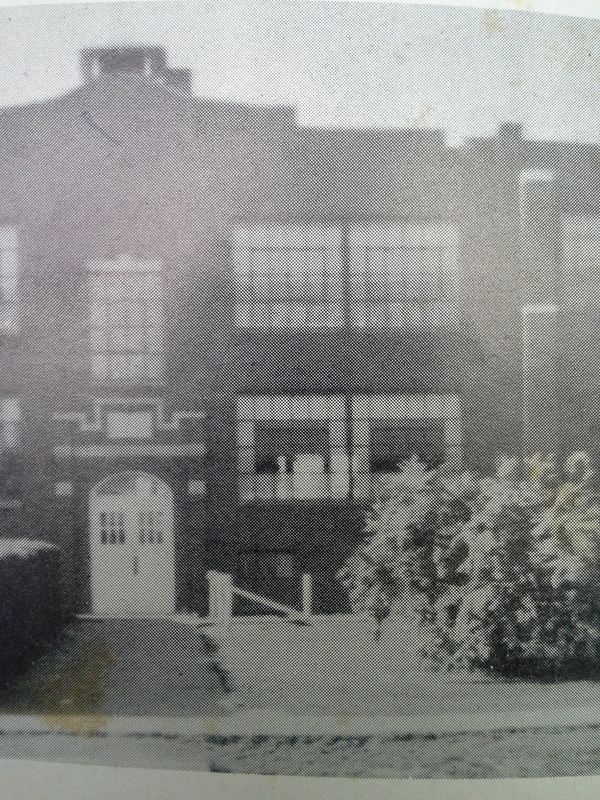 The last graduates of Williamson District High School graduated in 1944 and the building was then used for grades through the eighth grade. In 1959 the school was transferred to Chariton Community School District and modifications were made to accommodate increased enrollment. The long corridor on the first floor was enclosed into the existing classrooms to make the rooms later. The auditorium on the top floor was remodeled creating more classrooms. As time took its toll new windows were needed and installed in all the window openings of the building. In the last years of life of the Williamson building as a school the balconies in the gymnasium were removed because of the danger involved in the weight limit. Attendance gradually decreased until in 1995, Williamson school was closed and students transferred to the Chariton Community School District. A notable feature of the building as it still stands is an arched double doorway entry enclosed in attached pillars of brick with a concrete insert over the doorway with the inscription DHS (district High School). The pillars include a decorative concrete insert in the brick that extends across the top of the door and over the DHS insert. The east and west sides of the building include fire escape exists as does the north side. The Williamson school is locally significant under Criterion A for its importance to educational development of the town, the part it played in the social life of the community and it also was a vital part of each family’s life. The history of the school was interwoven with the activities of the entire community. George E. Williamson, founder of the Lucas County town of Williamson, was born, December 23, 1863 near Wataga, Illinois and at the age of six years came to Lucas County with his parents. The Family settled in English Township where his father, Peter farmed. He attended Sunnyside School and helped his father on the farm as a body. At the age of 18, he went to Wataga, Illinois, making his home with his uncle former State Treasurer of Illinois, M.O. Williamson and learned the harness trade. A few years later he returned to Lucas County, studied under Dr. Gibbon and became a registered pharmacist. In 1898, he married Jeanette However (known as Nettie to her friends). At the turn of the century, George and Nettie made their home in Webster City where George traveled as a pharmacist in northern Iowa for the Des Moines Drug Co. They had two children, a baby girl who died at birth in 1901 and a son George E. Williamson, Jr., who was born in 1903. George, Nettie, and their young son returned to Lucas County where he became associated with the Schriber Carriage and Wagon Co. of Chariton. By 1914, he had added acreage to his father’s homestead of 80 acres and owned almost a section of land. He laid out what was the town of Gunwald. In his town plans he set aside and donated one square block of land for the city park. In the 20s and 30s it was used mostly for Labor Day celebrations with carnival rides and medicine shows. Today the park, which he set aside, is now the location of the community building and bandstand. The Des Moines/Kansas City branch of the Rock Island Railroad was built through his farm land and in 1913 he donated land for the depot and rail yards. The railroad named the station for him and in 1922 the name of the town of Gunwald was officially changed to Williamson. As the need for a church and school became apparent he donated ground for the school built in 1923 and Williamson Community Church built in 1922. In addition to his farming operations, he founded the Williamson & Son Lumber Co. with lumber yards in Williamson and Purdy. In 1918, he built a two story home for his family just north of the commercial section of the town. George Williamson, Sr. became the new postmaster of Williamson in 1922, and served the next 11 years in that position. He also founded the Williamson Telephone Co. George died in 1934 at the age of 71. Nettie died in 1957 when she was 85. When the coal mining town was settled about 1912 there soon arose a demand for a school. Mr. G. E. Williamson built a building and rented it to the district to be used for the first school. This school soon became overcrowded. 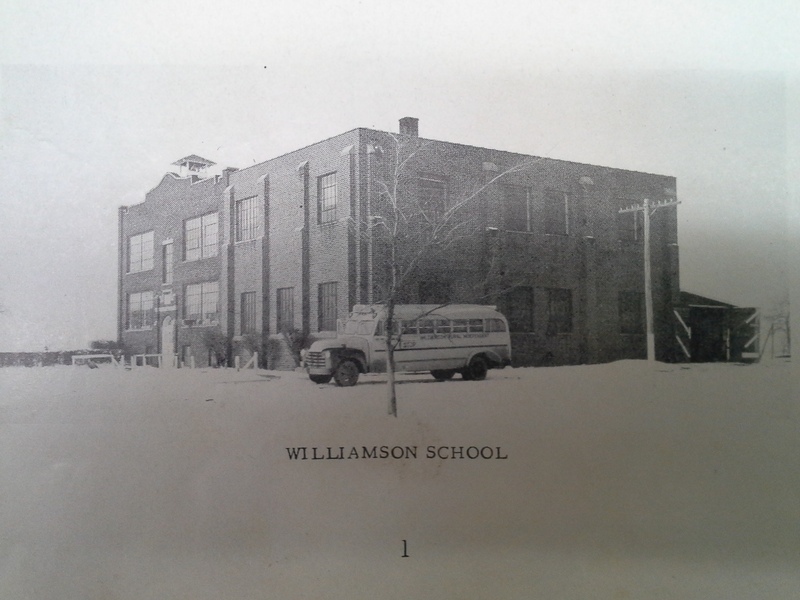 As a result, Mr. Williamson erected two new school buildings. These buildings housed only the first eight grades with two teachers, each teaching four grades. But before two years these schools had become quite insufficient to meet the large demand for education in the new town. Realizing this fact the school board began negotiations for a new and larger school. The school was designed by W.L. Perkins, an architect from Chariton, Iowa and the contract was let to Austin Enslow and son Monte Enslow, contractors, also from Chariton. The District School opened in September, 1923, with the first eight grades and three years of high school. In 1926, District High School graduated its first class, six in number. A new gymnasium and auditorium were added in 1929. The curriculum was extended, improved and modernized. The school became a significant part of community activities and a part of the history of mining, which had brought the town into being. School for many boys during Williamson’s early years were almost an impossibility. Williamson was a mining town, aside from the few engaged in the professions or business, most Williamson men were employed in the mines. The need in many families was an extra wage earner, so as soon as sons were strong enough they went down into the mines. Few attended high school and many did not care. But there were some who were not content, who longed for school and an education. Williamson School Superintendent Kridelbaugh devised a plan. The young men were allowed to attend classes when not employed in the mines and make up missed school work at home. This plan allowed the boys to work in the mines and go to school part time became known as the “Kridelbaugh System.” Several boys graduated high school and went on to successful careers. Since many of the children rode horses to school it was decided to build a horse barn in the school yard just north of the school building. This horse barn was used regularly for many years. The barn was no longer extant. Williamson became known as a school which produced many outstanding athletic teams, and the boys basketball team went to the state tournament in 1936. Baseball was a popular sport with two baseball diamonds on the school grounds east of the school building. The school and town produced many good baseball teams. The school was always supported by the community and had a big following in anything it undertook. The school always tried its best to organize the school curriculum in such a way as to measure up to the standards of the best in the United States secondary school. The Class of 1944 was the last graduating class from District High School at Williamson. The school continued with grades kindergarten through eighth grade until 1959 when the school became a part of the Chariton Community School District. It became known as Williamson Elementary with grades kindergarten through sixth. In June 1995, Chariton Community School District closed the school that had been a profound influence on many lives and the area for 72 years. In the spring of 1996, the building was sold to the Williamson Historical Society.